This Valentine’s Day cook and eat together whether it’s a savory cheese fondue or an amazing chocolate fondue dessert. It makes for a deliciously romantic evening for two. What could be more romantic than sitting fireside with a warm and rich Gruyere fondue and a glass of champagne? 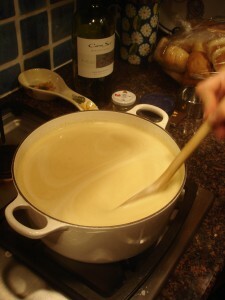 Fondue is a unique social event spent socializing, preparing and enjoying La Fondue having fun eating from the same pot. Served at room temperature when the cheese is bubbling lightly, this begins spearing a chunk of one of the dippables, gently swirling the bread in the melted cheese in a figure eight pattern, not in a circle. Another Swiss tradition is the browned crust that forms on the bottom of the fondue pot, called la croute, a treat awarded to a special guest. With just the tow of you, you might want to share it…what could be more romantic! Rub garlic clove on wooden spoon and inside the enamel coated fondue pot. Heat wine, being careful not to boil. Combine cheeses in a bowl and sprinkle the flour one tablespoon at a time, incorporating to coat the cheese. 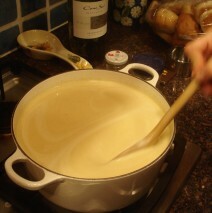 Add to heated wine and stir in a figure eight motion while cheese is melting. Heat must remain on LOW using only a wooden spoon for stirring. Add fresh lemon juice, and season to taste. Kirsch* or brandy may be added. Serve with dippables and a salad to complete the evening’s repast. The more decorative the dish and forks, the more festive the effect. * Kirschwasser, German for “cherry water”, or kirsch is a clear, colorless fruit brandy traditionally made from double distillation of morello cherries, a dark-colored cultivar of the sour cherry. The cherries are fermented complete, including their stones. Unlike cherry liqueurs and “cherry brandies”, kirschwasser is not sweet. The best kirschwassers have a refined taste with subtle flavor of cherry and a bitter-almond taste that derives from the stones with a peat similar to Grappa.